Hormones are of three types chemically. They are proteins, polypeptides amines and steroids. Their chemical nature determines their half life, solubility in plasma, transport and mode of action. Protein hormones are water soluble and hence they are carried in unbound form in plasma. Examples of protein, peptides and glycoprotein hormones are listed separately. The synthesis of these hormones is little different from proteins synthesized for intracellular activity. Protein hormones are synthesized as a large precursor molecule called preprohormone in the endoplasmic reticulum. Cleavage into prohormone from preprohormone occurs in the endoplasmic reticulum. The prohormones are transferred to Golgi apparatus for packaging into secretory vesicles. Within the secretory vesicle, another cleavage occurs, separating the hormone from prohormone. Insulin is synthesized as prohormone with 3 peptide chains. Cleavage in the secretory vesicle gives insulin proper with 2 peptide chains. Sometimes, a large prohormone complex such as pro-opiomelanocortin secreted from the anterior pituitary and adrenal medulla gives several peptide hormones on cleavage, such as, ACTH, MSH, lipotropin, endorphins and enkephalins. The secretion of protein hormones involves exocytosis, requiring Ca++ entry and expenditure of energy. The secretion also requires cytoskeleton (microtubules and microfilaments) for the transport of secretory vesicle to the cell membrane. The half life of protein hormones is short, because they are mostly carried in the plasma in unbound form. Protein hormones, peptide hormones and catecholamines are water soluble and in the dissolved form in plasma they are transported to the target tissues, where they diffuse out from capillaries. Some protein hormones like HCG (human chorionic gonadotrophin) appear in the urine in an active form, as they are not bound to the plasma proteins. Protein hormones cannot be administered orally, as they are hydrolyzed by the digestive enzymes. Hence they have to be given through the parenteral route for therapeutic purposes. Receptors for protein hormones are present on the surface of the cell membrane. Half life of hormones: The time at which the hormone’s 50% of the activity is lost in the circulation. They include thyroid hormones and catecholamines. Both are derived from the amino acid tyrosine and they are also known as phenolic derivatives. Thyroid hormones are T4 (thyroxine) and T3 (triiodothyronine). These hormones are synthesized outside the secretory cell in the thyroglobulin, present in the lumen of the gland. The synthesized hormone is also stored here. The hormones are lipid soluble and hence they are bound to the plasma proteins (thyroid binding globulin) and transported. Because of their protein binding, they have a long half life (T4 has 7 days, while, T3 has 1 day only). Receptors for these hormones are present in the nucleus. Thyroid hormones can be orally administered, as they are absorbed intact in the intestine. Catecholamines are epinephrine and norepinephrine secreted from adrenal medulla. They are stored in the membrane bound granules in the secretory cell. Catecholamines exist in both bound and free form. Their half life is very short. (epinephrine has 10 sec and norepinephrine has 15 sec) and hence their oral administration is ineffective, even though, they can be absorbed intact. 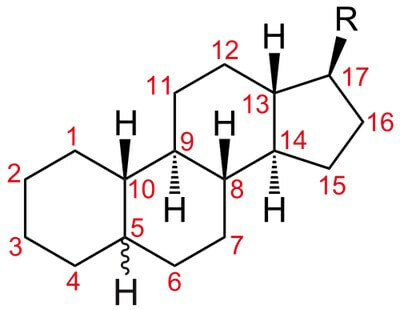 Receptors for catecholamines are present on the cell surface. Steroids are synthesized from cholesterol and they have cyclopentanoperhydrophenanthrene ring Examples of steroid hormones are given in the list. Steroid hormones are not stored in the secretory cell. They are lipid soluble and hence are bound to plasma protein globulin and transported. Their half life is in minutes (aldosterone has 30 min and cortisol shows 90 to 100 min). Receptors for steroids are present intracellularly in the cytoplasm and nucleus. They are readily absorbed intact from the GI tract and hence they can be given orally.